IS: I arrived at Baselworld to hear my colleague Elizabeth Doerr waxing lyrical about her meeting with new exhibition director new Michel Loris-Melikoff and replied, “The talk sounds good but I’ll believe the fair management is serious when the press room has fast Wi-Fi and edible food.” And lo and behold, I checked into the press office and was handed login details for fast Wi-Fi and the food was much improved. ED: I was pleasantly surprised by the tenor of Loris-Melikoff’s dealings with us, including what seemed to be open answers to questions and a forward-thinking approach to what Baselworld could and should become. It is important that we recognize Baselworld 2019 as a transition year and put our full attention on what happens in 2020, which will probably make or break the future of both Baselworld and the SIHH. See more about what’s coming up in Baselworld Becomes The Story: Baselworld 2020 And Beyond Will See Big (And Positive) Changes. SZ: Given the current situation of Baselworld I was positively surprised. Over the past years – especially in the boom years right before the new fair hall was unveiled in 2013, back then ironically called “the new era” – everyone has taken constant growth for granted. I can’t help but feel that the top brass of the former management was quite aware that meager years were to come and tried to get as much out of it as possible to fill their own pockets. MG: Taking into account that this was a transitional year with a limited amount of time for the new management to make changes, I think Baselworld did okay. The outside area was non-existent, but inside there was a better and more luxurious atmosphere. The new press center was very nice, though almost uncomfortable in the spotlights. ED: Not to worry, Martin, because it is almost certain that the position of the press center will be different in 2020, given that that is prime real estate inside the fair. I believe it was only put there because the Swatch Group, who backed out of the fair a few months ago, was still paying for the space and no other brands could take the position. 1. All big international exhibitions, whether car shows or electronics shows, are declining as brands focus on doing more closer to and directly with consumers and press rather than expecting everyone to travel to them. 2. It’s crazy that Switzerland has two big watch exhibitions (Baselworld and the SIHH) and while running them consecutively next year is a step in the right direction, the ideal (though not for the city of Basel) in my view would be for Baselworld to move to a big hall (or halls) beside the SIHH in Geneva. GG: For the first time I could imagine that Baselworld, and watch industry trade shows in general, might actually be doomed. That said, I found the announced new direction for Baselworld 2020+ intriguing: using my taxonomy of marketing channel roles, it seems that Baselworld is intent on expanding from its traditional role in promoting commerce to encompass journalistic content and broad community-building as well. We’ll see how that works; for an organization whose 2019 show app still had a map of the halls showing the 2018 exhibitors, becoming the fully connected, year-round center of gravity for the watchmaking and collecting communities seems a bit of a stretch, though I wish them well. MG: I think that the independents were far better positioned at this fair with the Les Ateliers section moving into Hall 1.0 south, but the AHCI booth a floor above was a bit strangely positioned, finding itself surrounded by brands that sell products for $150. ED: Martin, that’s not new. In recent years the AHCI booth seems to just get thrown in wherever the fair thinks it will fit in terms of space, not theme. Luckily, it is such a magnet and so self-contained it never seems to be an issue. In fact, I worried the first day that no one would find it, but it was always buzzing! ED: The Incubator was an interesting idea to accommodate new independents, but again it was something of a hodgepodge of little guys that the fair didn’t really know what to do with. However, the Incubator would be the perfect concept for pulling a bunch of the boutique brands and individual watchmakers out of the Hyperion hotel and back into the fair – which it desperately needs to do. What a disaster the Hyperion has become in terms of exhibition space! The fair really needs to do something about it. SZ: I do appreciate the efforts and new concepts that have been initiated under the new management so far. The overall number of Baselworld exhibitors has considerably shrunken, but the show still exudes the signature grandezza that only Baselworld has. The snippy remarks of some of our colleagues who criticize it, still blowing the same horn about the most expensive sausage in the world and more, does get me riled up as more critical contemplation does reveal change and much effort, not only concerning the show itself but also the surroundings. Rome wasn’t built in a day, and we all should be aware of the significance of the time needed and appreciate the efforts. Imagine there would be no more Baselworld: it would be like the heart of the industry being torn out. Whether you like it or not, Baselworld is the framework holding it all together. Just like a refined Swiss movement, each component has its job to do; spreading a doomsday feeling and just being malicious in some cases are not helpful to bringing Baselworld back on track. ED: Well said, Sabine. I have said it before and I’ll say it again: we need Baselworld. IS: I submit, Elizabeth, that the belief that Baselworld is “needed” is what got the fair into such a deep hole in the first place. If it was really needed then so many brands, press, and visitors wouldn’t have decided it made sense to stay away. The main issue as I see it is that the fair is not only not needed, it has also become unwanted by so many brands, press, and visitors. Baselworld now looks to be on the right path (finally), and I wish the new management all the best but they have a long uphill struggle ahead. MG: In the end, it was a decent show but not a very exciting one in my opinion. This is partly due to Baselworld itself, but also partly caused by the brands. Even the best atmosphere cannot save the lack of tantalizing products, and vice versa the perception of great products can suffer when presented in a mediocre environment. This year it was neither one nor the other, with plenty of good products presented in style, yet not much really jumping out. Next year will be a whole different ballgame: Baselworld will be right after SIHH, forcing some brands to choose as to whether to exhibit at one or the other. Some might also go for the third option – like the Swatch Group, Maurice Lacroix, Corum, and Bremont – which is neither. They might decide that their marketing francs, yen, or euros are better put to work in other ways. While Baselworld is struggling for survival, and not doing a bad job at it so far, the whole concept of large trade fairs might prove to be obsolete in the end. SZ: In terms of products I felt like most of them were line extensions. There were some beautiful vintage-style timepieces like almost all the new Breitling introductions, with the Premier B01 Chronograph 42 Norton Edition being my favorite, and the Carl F. Bucherer Heritage Chrono BiCompax Annual. There was a host of colorful timepieces but also some elegant examples with muted hues such as Nomos’s Tangente Update 41 Ruthenium and Patek Philippe’s very cool and refined Calatrava Weekly Calendar in steel with a “handwritten” typefont. I also noticed the return of the tourbillon with Chopard’s L.U.C Flying T Twin being the technical and aesthetic leader among them. I feel like after years of everyone being a little tired of yet another tourbillon, this is a nod to the roots, original ingenuity, and savoir-faire of horology. GG: “Low-key” would be the term I would use to describe the content of the show: few blockbuster product introductions and certainly quieter than in past years given the smaller number of exhibitors. In areas such as the independents’ section on the ground floor of Hall 1, greater spaciousness than in the past made things seem less busy than they were. ED: And the independents in that section certainly showcased what they are capable of: Urwerk’s UR-111C, Romain Gauthier’s Prestige HMS with a gorgeous meteorite dial, MB&F’s Legacy Machine FlyingT, and the Louis Moinet Ultravox were just the tip of the iceberg over there. IS: I was impressed with Canadian boutique brand Beauregard, whose sublime gem-set flying tourbillons blew me away as did the incredibly competitive price of Arnold & Sons’ superb Time Pyramid Tourbillon at $39,995 (in steel). ED: Both watches that I will be calling out below, Ian. Unbelievable creativity! MG: Best of show was for me this year the Zenith Defy Double Tourbillon. This watch features two tourbillons, one of which serves as the escapement for the timekeeping and beating at 36,000 vph/5 Hz. The other one is connected to the chronograph function as its regulating organ. The moment that I pressed the pusher to activate the chronograph and saw that this tourbillon started running at 360,000 vph/50 Hz (and, no, this is not a typo!) I was sold! What an incredible sensation to see a tourbillon run at this breakneck speed! GG: For me the top watch of the show was Kari Voutilainen’s 28ti (which stands for “Titanium Inverse”). While it has become a bit of a cliché to say how great it would be to wear one of Kari’s watches with the “movement” side facing up, he actually executed on the idea – and it’s excellent! And it wasn’t just a matter of flipping the movement over and extending the hour and minute pinions toward the other side of the movement; of course the hands now need to turn in the opposite direction, and Kari also re-worked the plates on what is now the “back” of the dial to conceal the screws and pins that would normally protrude through them and made cutouts to reveal the moving gear train. IS: It’s far too difficult for me to narrow the choice down to just one watch, but I’ve got it down to four: the H. Moser Venturer Concept Small Seconds XL Arctic Blue (which the team has nicknamed the “Fernanda”) is one of the best-looking watches I’ve ever seen in my life, and then there is the MB&F Legacy Machine FlyingT. 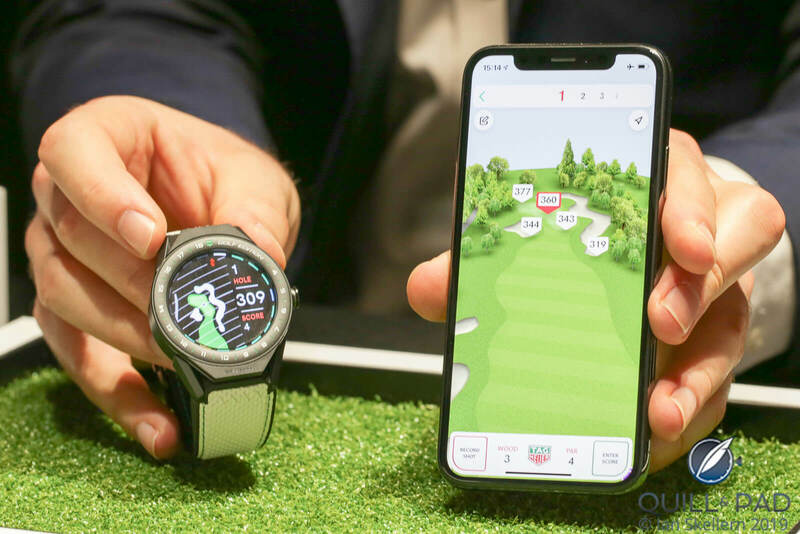 A non-mechanical watch that blew me away was the TAG Heuer Connected Modular 45 for golf with its accompanying app. And Kari Voutilainen’s 28ti ticks all of the boxes for me. ED: For me it was hands down the MB&F Legacy Machine FlyingT. All the watches mentioned here have their merits for sure, but when MB&F founder Maximilian Büsser told me he specifically created the FlyingT with women in mind – for which reason it is launching first in the diamond-set versions before the non-set versions arrive – I knew I was lost to this ingeniously crafted timepiece. Everything fits so perfectly together; I just cannot stop looking at it. SZ: For me it is Porsche Design’s new 1919 Globetimer UTC offering advanced GMT technology allowing the current time zone to be easily adjusted in one-hour segments by means of a pusher without losing the exact time setting. It certainly caught my attention! It also demonstrates the evolution of a brand that seizes its potential in terms of clever engineering. IS: “Advanced,” Sabine? While the Porche Design UTC is certainly a useful complication, I think it only fair to mention that Ulysse Nardin did the same thing a decade ago. And while I wasn’t convinced by the health theme that new boutique brand Alchemists offered along with its first watch showing at the Three Kings hotel, it is certainly a very interesting timepiece (and Philippe Dufour likes it). MG: I have two: the first is the Tudor Black Bay P01, which is so hideous it almost hurts my eyes. Beauty is in the eye of the beholder, sure, but that bracelet/strap combo should have never made it into production. Unfortunately, the watch needs it as without the model is lost in the ocean of other Tudor Black Bays. And if there was one thing that the Patek Philippe Pilot Travel Time didn’t need it was more crowns, yet that’s exactly what the brand added with the Reference 5520P-001 Alarm Travel Time! The movement and the complications are amazing, but the watch itself looks like a G-Shock for trust-fund babies. You really want to hold on to this one for the next generation, preferably locked up in a safe so at least this generation doesn’t have to look at it. ED: (laughing) Wow, that was harsh, Martin! I guess you feel strongly about these two . . .
GG: Happily for me, I don’t spend much time at shows anymore checking out watches and brands that I have little interest in; and perhaps I’m mellowing a bit with time so am less critical! I’ll confess that I didn’t really see anything that I recall finding offensive or deeply disappointing, but one watch that struck me as odd was the Rolex Cosmograph Daytona Reference 116588TBR. Apparently, it has picked up the nickname “Wildcat,” but for me it looked like a failed attempt by Rolex to make a Cartier. I actually have a bit of affection for some of the wackier jeweled Rolexes, but this isn’t one of them. ED: For me it was very likely Lang & Heyne. The abrupt departure of co-founder Marco Lang a few months ago has made itself noticeable this year, and while the latest version of the Georg timepiece with a black dial is still beautiful, it is simply a line extension. Co-founder Lang was the creativity driver at that brand, so I suppose I shouldn’t be too surprised that there is no “wow watch” there this year, just a new dial. IS: I could close my eyes and throw a dart as there are far too many disappointing watches for me to choose from. Ninety-nine percent of the watches I see at the big exhibitions have zero interest for me as they are simply a splash of makeup on an old face with PRs repeating the mantra of innovation hoping it sticks. It’s that one percent that keeps me coming back for more each year. While not a watch, I was disappointed with the location of the new Incubator section. It was a good idea but why, when there is so much free space, did they make it so difficult to find? That should have been positioned near the AHCI stand. SZ: The most disappointing watch for me doesn’t exist. Let me explain: TAG Heuer’s Monaco celebrates half a century of existence in 2019. Given the rich history of this watch – one of the first automatic chronograph models, the first water-resistant square case, its high-octane “DNA” – I would have expected much more ado and at least one reedition at the fair. And it would have been nice to have a first look at the book they announced shortly before Baselworld. ED: To be fair, Sabine, TAG Heuer has announced several Monaco arrivals throughout this year and probably did not want to take the focus away from the new Autavia Isograph, which is a huge technical launch. But I get what you mean. SZ: I had also hoped that the other participants in “the race for the first automatic chronograph movement” (the “Chronomatic Group” including Breitling and Heuer in addition to Zenith with the El Primero and unknowingly Seiko), which took place 50 years ago, would have commemorated this major milestone with some authentic reeditions. Zenith did bring out commemorative watches to mark this milestone at the fair, though its major focus was on the future with the Defy Inventor and not the past. SZ: I would buy the steel version of Carl F. Bucherer’s Heritage Bicompax Annual for it is a beautiful example of 1950s’ style. My favorite is the panda-style dial with black chronograph counters against a silver background. IS: I’ve just bought a new house, so my watch budget is nonexistent, but I love the new designs of Cuervo y Sobrinos and I long for a Tudor Black Bay. MG: The Chopard L.U.C. XP with stainless steel case, brushed blue dial, and wool strap. What an incredible creation! One of the few watches where every detail is just perfect! The fact that it also matches my personal style so very well helps of course, too, as I am a sucker for movements fitted with a micro rotor. This watch was part of Chopard’s subtle yet decisive move toward connecting with a new, younger clientele along with the L.U.C Chrono One Flyback. GG: I came very close indeed to buying a Voutilainen 28ti, but with some other incoming pieces in the pipeline and several recent purchases (without offsetting sales) I just couldn’t bring myself to do it – unlike a close NorCal friend, who pulled the trigger before the eight examples in titanium sold out and who is now the subject of my deep envy! As in past years, I found many of the Rare Crafts pieces at Patek Philippe mouthwatering; if you have a chance to attend the show, it pays to summon up your courage and venture inside the Patek Philippe booth to see the display of wristwatches, pocket watches, and clocks. Speaking of clocks, the timekeeper I’d be inclined to buy with my own money is the Time Fast D8 from L’Epée 1839, developed in partnership with design student Georg Foster with the coaching of independent watch designer Fiona Krüger. ED: I saw a number of watches that would interest me personally and could see myself purchasing. One is the Christiaan van der Klaauw Lady Orion Stardust as I am a huge sucker for the combination of aventurine and diamonds, and there is no one who combines these two elements better than this independent brand! It is so feminine and elegant, yet in no way run of the mill. But also the TAG Heuer Autavia with Isograph carbon-composite spring, which comes in at a rather affordable $3,500. And I finally found the Tudor that I could see myself wearing with gusto: the Black Bay Chrono S&G on a superb bund strap. But I was also highly enamored of Stefan Kudoke’s Kudoke 2 with its manufacture movement crafted by Kudoke and Habring, the superb finishing the master engraver has applied, and the simple dial showing off more of that elegant mastery of decoration. And, if I were to buy one more, it would definitely be the Arnold & Son Time Pyramid Tourbillon in steel for $39,995: so so so so much watch for the money! IS: I strongly disliked Ferdinand Berthoud for at least 6-12 months after the brand’s launch as the design made no sense to me at all. That changed when I first had a chance to handle the FB 1 and now I’m a dedicated fan of the brand. The new FB 1L.4 is sensational. While I’m fantasizing about “money no object,” I’d be overjoyed to have any clock (though they are so much more than timekeepers) by AHCI member Miki Eleta. His work is absolutely sensational on every level. SZ: For me it would be the Chanel Monsieur Noire Edition. I love the original edition (see it in detail in Surprising Ties That Bind: Chanel And Romain Gauthier), but with my weakness for black timepieces I love this special edition. MG: There are two this Baselworld: like Ian, I found the new Ferdinand Berthoud 1L.4 to be a superb creation. It has a novel and innovative approach to displaying the phases of the moon that ties in so nicely with the history of the brand. It is a pure display of how the steady yet passionate hand of Karl-Friederich Scheufele can direct a brand to greatness! Talking about greatness, this Baselworld I also happened to spend some time with David Candaux. This watchmaker is as modest as he is brilliant, and he has that same contagious excitement and passion as Scheufele. He explained me his DC6 Solstice, a watch full of details and technical delight, but first and foremost built with so much knowledge and expertise that you have to fall in love with it. GG: With your money, I’m buying MrsGaryG the MB&F Legacy Machine FlyingT – and not just because I enjoyed writing my recent Why I Gave it: Fiona Krüger Petit Skull (Celebration) Eternity so much! This is a wonderful technical achievement, and to my eye an aesthetic treat as well. The stacked tourbillon assembly reminds me of a stack of presents, with the time-telling dial leaning against the front and discreetly angled toward the wearer. And I love that Sun King winding rotor on the reverse! Luckily for you, I’m drawn most strongly to the “simple” version with the black lacquer dial – but keep your bank account warmed up in case MrsG votes for the pavé or baguette version. ED: I hate to keep mentioning the same watch over and over, but, yes, I’d join MrsGaryG in really, really wanting that MB&F Legacy Machine FlyingT . . . alternatively, I would go with the gorgeous Grand Seiko Spring Drive Manual Wind Elegance with snowflake dial and platinum case. And, yes, it sublimely fit my wrist! And, alternatively to that, one of those incredible Beauregard Dahlias with the carved gems set around a central flying tourbillon. I could not stop oohing and aahing. 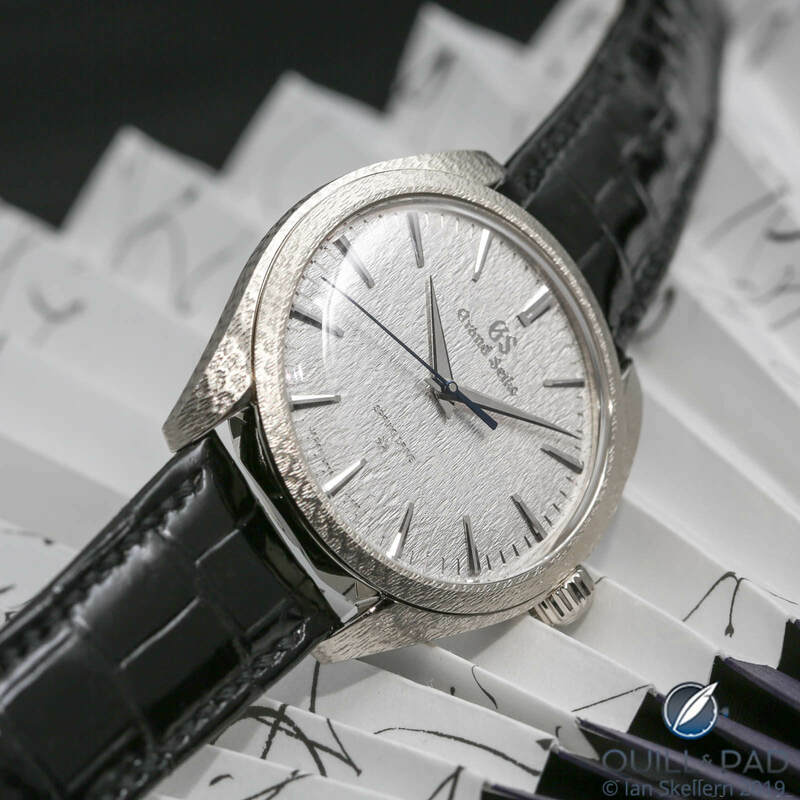 So much for just one object of desire – I guess it was a good Baselworld after all! IS: Not that Akrivia looks like it needs my patronage as the brand is on a roll (as are the Grönefelds), and it’s not a watch new this year, but I’m still lusting after an AK-06. SZ: MB&F’s LM FlyingT, of course! What a breathtaking stage and a most creative interpretation of the tourbillon. MG: This watch is technically not a new release for Baselworld, as Bulgari already showed it earlier this year in Geneva, but the new platinum Gérald Genta Bi-Retro is absolutely superb! For this commemorative piece, Bulgari has forgone the double branding that Gérald Genta was subjected to at the end of its life cycle and brought it back to when the brand was at its zenith. The watch is pure, simple, and so Genta! I can only hope that this is just one of many more to come! GG: This one’s another Finnish entry, but this time from Stepan Sarpaneva: his now-complete Lunations. In particular, I loved the piece that he showed at the fair with engraving by wizard artist Joanne Ryall. We saw a prototype of the Lunations last year, but the finished watch is even better and the use of a bundle of fiber optic elements to transmit light down to, and then back up from, a white disk representing the moon makes for a display of the moon’s phases unlike any I’ve seen before. ED: This is an interesting question as always because the independents really make up my true loves in the watch world. I think, though, that I would go with Stefan Kudoke’s Kudoke 2 as described above from Baselworld 2019. It surprised and delighted me to no end. IS: Few watches make me smile like Konstantin Chaykin’s Joker, and his Dracula version with fangs displaying the power reserve shows that serious horology can be a lot of fun. Speaking of fun, I thought Andreas Strehler’s moustache deserved a stand of its own! ED: I would be sorely tempted to agree with you on Chaykin’s Dracula, Ian – it is just so darned creative! GG: I’m guessing that most folks don’t often associate the terms “fun” and “Patek Philippe,” but I was drawn to the whimsy of their new Reference 5212A Weekly Calendar. Indicating the 53 calendar weeks is a bit of an offbeat complication, the watch in steel is at least somewhat approachable in price, and the use of a font taken from handwritten script is a clever departure for this brand, and, dare I say it, fun! SZ: Also MB&F’s LM FlyingT. It is mesmerizing to watch the spectacle taking place beneath the domed sapphire crystal. MG: There weren’t a lot of “fun” watches this Baselworld, as most brands took themselves way too seriously, but at Hublot I ended up with a “rainbow” Big Bang Unico on my wrist. This is a watches that is not only the complete opposite of my personal style but also falls into a category in which you simply don’t want to admit in public that you actually quite liked it! I call it my guilty pleasure, yet I am not afraid to admit that it is a delightful one! ED: . . . and even though I almost went with the Chaykin Dracula, I am indeed going to side with Martin and nominate that Hublot Big Bang Unico Rainbow as my fun watch. Its colorful countenance just made me smile, and when I sent a photo home to my daughter her reaction delighted me even more. Yep, I’ll call this one a guilty pleasure and like it! Bring on the sunglasses! Let us know what you liked and what you didn’t like in the comments below. Baselworld 2018 Round Table: What We Liked And What We Didn’t Like At The World’s Largest Watch Fair. Excellent review. I appreciate the common sense approach to improving Basel. You’re right – others just want to give the management a beat down.